It never fails - new visitors to Arizona usually have the same "take away" comments. "It's Hot." "Those Saguaros are amazing!" "I never saw so many lizards." In Phoenix you might see Ornate Tree Lizards, Common Side-Blotched Lizards, Tiger Whiptails, some non-native geckos, and maybe a Chuckwala if you hike one of the parks. Get a few miles outside of town and you'll find all sorts of other interesting lizards. In the foothills and mountains, the Greater Earless Lizard, Cophosaurus texanus, is one of the most spectacularly colored. The above photo is of a "dull" female. The males will get a greenish-blue hue on their legs and tails, and even a bit of yellow. Unfortunately, I do not have a decent male photograph in my collection (yet!) By the way, it is called an "earless" lizard because of the lack of an ear hole. 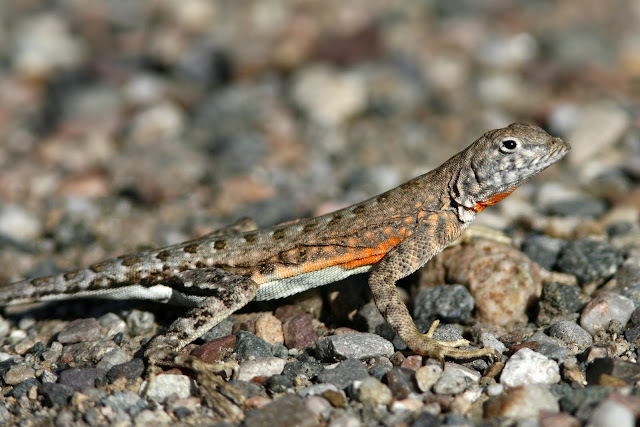 Greater Earless lizards can be seen from central and south Arizona into central Texas, and south in Mexico. Like many lizards, it is a ground-dweller that eats insects (spiders, grasshoppers, crickets, etc). As alluded to above, it is generally seen above the low desert, but usually not in high elevations. If you're looking for an excellent (albeit large) field guide to lizards, I highly recommend Lizards of the American Southwest. The details of his skin are terrific. Wonderful selective focus and tones too. Her camouflaged markings aren't working!! I lived in Tucson for over a decade and the one most interesting to me was the gila monster...so slow moving compared to all the other reptiles. incredible detail - very sharp. nicely done!